The Elementary Teacher Education Program at Bishop’s University is a two step program leading to two degrees, a Bachelor of Arts in Educational Studies and a Bachelor of Education. This combination of degrees is required in order to be eligible for a Quebec teaching permit or “brevet d’enseignement.” This degree only certifies you to teach in the province of Quebec. If you are planning to teach in another province, it is your responsibility to contact the Ministry of Education in that province to see what additional courses are required to certify you to teach in their province. The first degree prepares the student to teach a broad range of subjects that can be found in the elementary curriculum. Students who have completed another bachelor degree will be required to follow this program as part of their B.Ed. The Secondary Teacher Education Program at Bishop’s University is a two step program leading to two degrees, a Bachelor of Arts (B.A.) or a Bachelor of Sciences (B.Sc.) with a Double Major (Education and a teaching discipline) and a Bachelor of Education (B.Ed.) This combination of degrees is required in order to be eligible for a Quebec teaching permit or “brevet d’enseignement.” This degree only certifies you to teach in the province of Quebec. If you are planning to teach in another province, it is your responsibility to contact the Ministry of Education in that province to see what additional courses are required to certify you to teach in their province. The first step of the two-step program normally takes 3 to 4 years to complete. During this step, students take courses related to the subjects they will be teaching, take courses in education, and fulfill practicum requirements. Students must choose from one of the following ten profiles: Mathematics, English, Teaching English as a Second Language, Social Studies, Science Teaching Major (one of Biology, Chemistry or Physics), Fine Arts, Music and Drama. The first degree, the BA or BSc, is a 93 credit (120 credits for students from out of province with grade 12) program with a Double Major in Secondary Education and one of the above profiles. This degree may be completed on a part time basis. The second degree, the B.Ed., is a 36 credit program that must be completed on a full time basis and begins in the fall semester only. 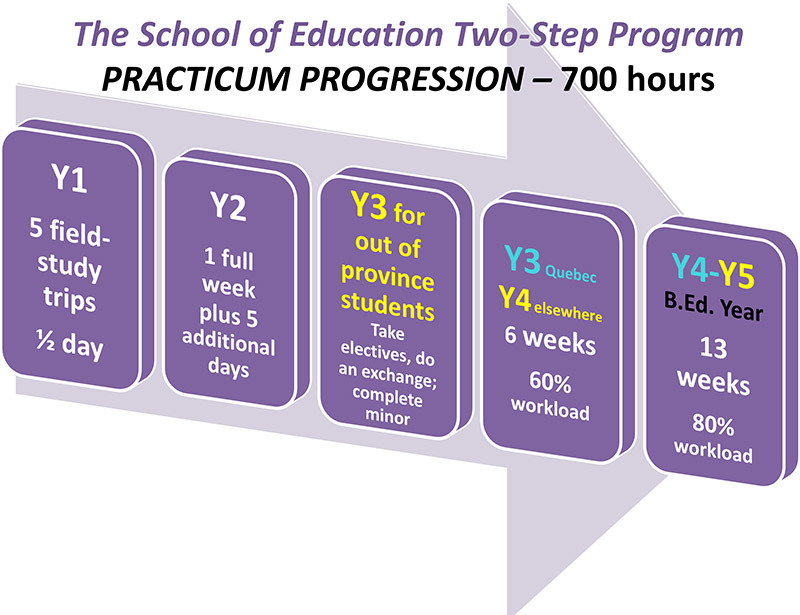 During the second step of the two-step program, students take courses in education only and complete a 13 week practicum. See our archives for profiles from previous years. EDU 419 – Interdisciplinary Teaching & Integration of Learning – Elem.